Yes, that exclamation point above is needed. This cookie is amazing and crazy easy. Yay for easy, right? In fact, the only real problem with this cookie is that it will be rapidly consumed. See that thumbs up? It’s for real. Preheat oven to 350 degrees. In a medium bowl, whisk together flour, baking soda, cinnamon, and salt; set aside. In the bowl of an electric mixer fitted with the paddle attachment, cream butter and sugars until mixture is light and fluffy, about 2 minutes. Add egg; mix until fully incorporated. Add flour mixture, and beat until just combined. 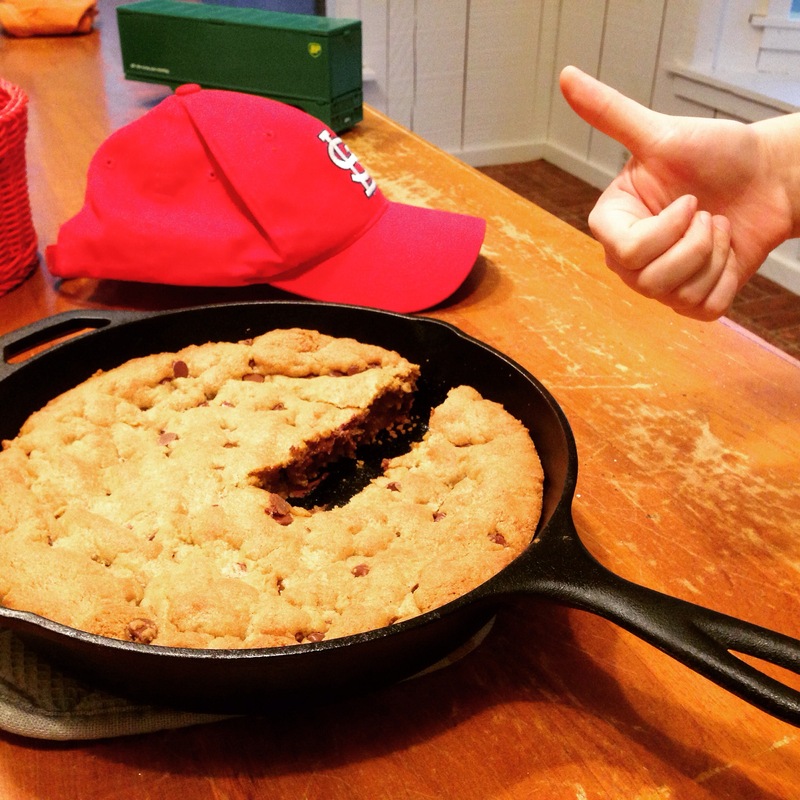 Transfer dough to a 10-inch ovenproof skillet, and press to flatten, covering bottom of pan. Bake until edges are brown and top is golden, 40 to 45 minutes. (Watch it — mine takes much less time but I think my oven is kind of an overachiever. I haven’t had this oven long so I’m still trying to figure it out. ) Don’t overbake; it will continue to cook a few minutes out of the oven. Transfer to a wire rack to cool, 15 to 20 minutes. Cut into wedges and serve with ice cream and caramel sauce, if you want to be fancy. It’s yummy, y’all! Happy Friday! This cookie is legit. I love ’em. I even loved that one we wrapped up in tinfoil, lost, and then found 5 days later – it was still amazing. And I won’t have to have cookie envy for long- chocolate chips are on my list! Thanks for the recipe! And by the way, it’s really good to hear from you! I have missed your posts! Hey Abby! Thanks for stopping by! We’ve been thinking of y’all and praying, too. Hugs to you! This is going to be the first recipe that I help my 8 year old learn! It seems perfect for a learn-to-bake situation! And I love reading about your Mardi Gras music. It’s a big part of our life now that we live on the coast (in Mobile.) Schools were out all of last week and most employers take off Mon-Wed. It’s a fun time of year! Again, so glad you’re back, and thanks for the recipe! Hey Fittsy! Good to hear from you! Thanks for visiting…I think you’ll enjoy this cookie :). Also, that’s interesting about bring out of school for Mardi Gras — Jon remembers that fondly from his childhood.